As it gears up for Sam Houston State University's first capital campaign, the Office of University Advancement has recently added six new staffers. Deciding how to handle all the money it plans to raise should be no problem, as three of the new employees have banking experience. Thelma Mooney, a 1977 SHSU business administration graduate, will be responsible for development relations with a focus on the capital campaign and implementing a system for a long-term private funding program. 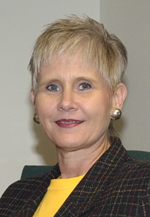 Mooney worked previously for the Texas Department of Corrections while she attended SHSU and then American Bank of Huntsville for nine years. At First National Bank of Huntsville, where she worked for 17 years, she was senior vice president and cashier responsible for bank operations. Working with Mooney will be Jacque Miller and Brigitte Peres. 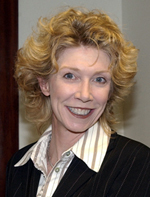 Miller was director of undergraduate alumni affairs for the W. P. Carey School of Business at Arizona State University. She has also worked as an alumni association assistant director and managed game day operations and events for the athletic department. She earned her bachelor's degree from Brigham Young and her master's in public administration from Arizona State. 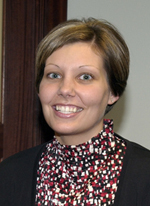 Peres, who will be the administrative coordinator for the capital campaign, worked most recently as executive secretary in the administration office at Witham Memorial Hospital in Lebanon, Indiana. Before that she worked as executive secretary/office manager at the JP Morgan Chase Bank for 14 years, after receiving her bachelor's degree in general business from SHSU. The alumni relations office, which is also aligned under university advancement, also has two new employees. 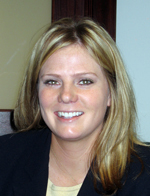 Emily deMilliano joined alumni relations in November 2004 as assistant director for membership and marketing. 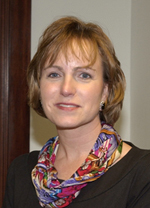 Previously she was public information officer for the Huntsville school district. 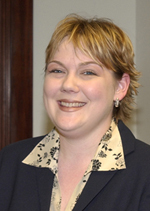 DeMilliano received her degree in journalism and public relations from SHSU in 2001. In addition to her alumni position, she serves on the board of the SAAFE House, the Huntsville Item Reader Advisory Board, and the women's council at her church. On Feb. 1 Rachel Larrison joined the alumni relations team as event coordinator, and will plan occasions hosted and sponsored by the association. She is also pursuing her master's degree in business administration at SHSU. A Huntsville native, Larrison received her bachelor's degree in marketing and communications from Houston Baptist University, served on the HBU alumni board of directors, and worked in executive recruiting and marketing in Houston. Also aligned under university advancement is Kris Ruiz, university marketing director, who will work in the areas of marketing and advertising, promotions, merchandising, strategic communication and corporate identity programs. Ruiz previously served as senior vice president - marketing director of Klein Bank & Trust, which merged with Southwest Bank of Texas in October of 2004. She earned her bachelor's degree in finance and her master's in business administration with a marketing emphasis from the University of Houston. "We are extremely pleased with the experience and skills represented in our new staff members," said Frank Holmes, vice president for university advancement. "Combined with the talented individuals already on board, we are well positioned for this important next step in Sam Houston State University's advancement progress."